There is still a familiar look to Main Street now that the work to replace the Presbyterian manse has been completed. The old stone wall and pillars have been retained but behind them stands a very much enhanced building. Designed by Architect, Robert Logan of 19 Main Street, Doagh and built to the highest specifications, almost on time and within budget, by W&R Moore Construction Ltd, Central Park, Mallusk, Newtownabbey, the manse sits proudly at the entrance to the village. Last weekend, many members of the congregation and others from the village took the opportunity to view the new building before Rev James Rogers, along with Karen, his wife, and their young family moved in to make it their home. All agreed that it was a marvellous building and that it should serve the congregation well for the next 100 or so years, just like the one before. 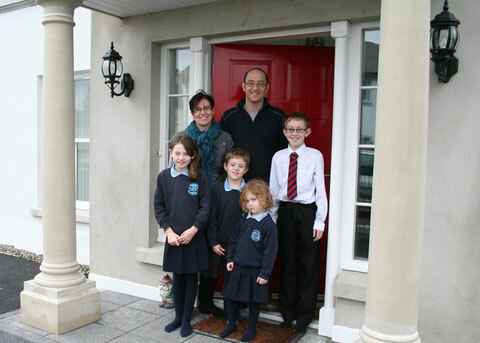 There was great excitement in the Rogers household, and just a little sadness, as they prepared to move from their temporary rented accommodation in Castle Road where they had spent the last two and a half happy years since coming to Ballynure. While the building retains many external similarities to the old manse, the opportunities that a new build bring have led to a much improved internal layout, with better use of space, and the house is finished with modern fixtures and fittings suitable for family life. Advances in insulation and building materials will also make it a much easier place to heat and maintain and it should not be too long before the house becomes a home. The new manse has been designed to meet the guidelines of the Presbyterian Church in Ireland and marks the final part of the vacancy process as outlined by the Carrickfergus Presbytery. Rev Robert Bell, who oversaw the building work on behalf of Presbytery, was pleased to be able to report this at the November meeting. Rev Sidlow McFarland, who had convened the vacancy, dedicated the manse to the glory of God in the morning service on October 9th. Erecting the new manse has only been possible because of the generosity of the members of the congregation, some of whom have also ensured that fixtures in the house are of the highest quality. Even in these times of financial restraint when giving is down, many have contributed on a regular basis or donated to the Harvest Appeal, while others in the village have also supported the fund-raising activities that have been ongoing for the past couple of years since the it became clear that the old manse would be need to be replaced. So, once again, the Presbyterian minister and his family are back on Main Street and the church is looking forward to him being there for a long time to come, working and witnessing as the leader of the team of committed Christians who spread the good news and the love of Jesus Christ in the village of Ballynure and beyond.